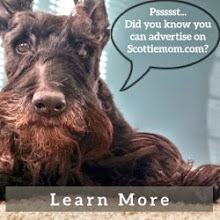 Scottie Mom: Lost & Found: Scottie Groomer! For those that have been following the Scottie Mom adventures for a while, you know Heather and Mr. K have been in the market for a new groomer for quite some time. 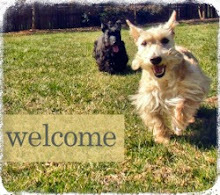 Following my move to Atlanta nearly two years ago, it became clear that I would miss Vivian, my groomer at A Dog Eared Corner in Columbia, S.C., and I set out immediately to find a Scottie groomer who not only knew what they were doing but who could do as good a job as Vivian. And, it is with much happiness and relief that I tell you: it appears my search is finally over! A little over a month ago, I ran into a fellow Scottie owner at the grand opening of Barking Hound Village, a new doggie daycare, boarding and grooming facility in our neighborhood. He told me about a groomer named Barbara who not only groomed Scotties but owned them as well. Dear Heather was in need of a bath and a good trim (the last groomer hardly trimmed her hair at all so she was looking extra scruffy) and so, I decided to press my luck on a whim and see if this Barbara had any last minute appointments for this weekend. Turns out, she did and had me come into the shop within an hour of the time I called. I can honestly say this was the first time I ever felt excited to see my pups after a grooming apointment. There was no anxiety over how they would come out looking this time and I owe a lot of that to the Scottie Dad who first told me about Barbara and the amount of time she spent with us before taking Heather and Mr. K back for their new do's. I learned that Barbara is the proud Scottie Mom of nine, one of which currently holds rank as fifth in the nation among show Scotties. Needless to say, I was very much impressed when I got the call from Barbara herself letting me know Heather and Mr. K were ready to pick up only two short hours later. She even shared some tips for keeping Miss Heather (who tends to be the stinkier of the two Scotties) from getting so oily by switching from an oatmeal shampoo to a tea tree oil based shampoo. The best part of the experience was the pleasant surprise of how reasonable her pricing was. Only $12 more than what I typically pay at Petsmart and considerably less than what I have paid at other local boutiques around town, I think it is safe to say that Barking Hound Village will be visited again on more than a few occasions for some serious Scottie styling! Raffles is having his first groom on Wednesday - that should liven our local grooming store up! The lady who did the poodles so well has left so The Producer is a little concerned about how he'll look. Glad you have found someone who is doing a good job. WOW! Looks like Miss Barbara knows her stuff! She's a keeper!!! They are most adorable!!! So glad you found a groomer that you like!! Not just anyone can properly cut our sweet Scottie's!! !